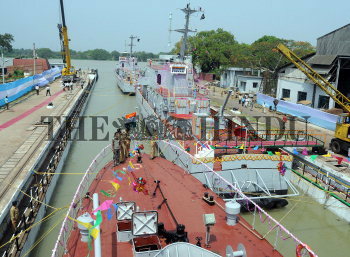 Caption : Kolkata: Garden Reach Shipbuilders and Engineers Ltd. (GRSE) launched the 8th, 9th and 10th of the series of ten Water Jet Fast Attack Crafts at it?s Raja Bagan Dockyard on Monday. The ships were named as INS Kabra. INS Koswari and INS Karuva after the names of the islands in the Arabian sea. Photo: Arunangsu Roy Chowdhury March 29, 2009.